Title first published in 2003. Despite all the hype about e-learning, the real breakthrough in technology, at least as far as HR goes, is in the development of the corporate intranet for people management purposes. 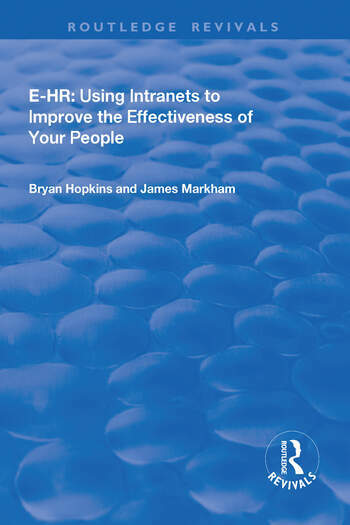 Bryan Hopkins and James Markham's book explains the potential for intranets in every aspect of HR: personnel administration, performance management, employee development, communication and knowledge management, as well as training and e-learning. It asks and answers the key questions you need to ask yourself and provides case studies illustrating how organizations have successfully exploited their intranet to help their people work more effectively and efficiently. HR managers are under pressure to cut costs, increase the effectiveness and range of the services they deliver. In many organizations there is also considerable pressure to maximise the returns on investment in technology. This book provides you with the means to achieve all of these goals. Contents: Introduction; Why put the 'e' in e-HR? ; How does intranet technology work? ; What kind of e-HR is right for your business? ; Delivering core HR services; Managing people more effectively; Improving collaboration and learning; Enhancing employees' benefits; Planning your e-HR implementation strategy; Implementing IT systems; Implementation checklist; Glossary; Index. Bryan Hopkins is an independent consultant who specializes in the design of information and learning materials. He has developed and delivered solutions for a large number of clients from both the private and public sectors. His previous book, How to Design and Post Information on a Corporate Intranet was also published by Gower. James Markham is one of the founding directors of B2E Solutions Limited - a management consulting company that specializes in helping organizations with the design and change management challenges of e-HR, e-learning and other people/technology programmes. He has 15 years' international consulting experience and has lectured in Organization Design and Human Resources at MBA level. He is a Fellow of the Institute of Management Consultancy and of the Royal Society for the Encouragement of Arts, Manufactures and Commerce.